Here are some ideas for day two: kick back and relax at La Caletta Beach and then stroll through Spiaggia di Sa Curcurica. To find more things to do, reviews, traveler tips, and other tourist information, read our Dorgali itinerary planner. Manchester, UK to Dorgali is an approximately 8-hour flight. The time zone difference moving from Greenwich Mean Time to Central European Time is 1 hour. Finish your sightseeing early on the 12th (Tue) to allow enough time to drive to Cabras. Kick off your visit on the 12th (Tue): examine the collection at Civico Museo Archeologico "Giovanni Marongiu", then contemplate in the serene atmosphere at Chiesa di San Giovanni in Sinis, then enjoy the sand and surf at Maimoni Beach, and finally don't miss a visit to San Salvatore di Sinis. Get ready for a full day of sightseeing on the next day: kick back and relax at Sa Mesa Longa, identify plant and animal life at I Gatti di Su Pallosu, and then steep yourself in history at S'Archittu. For reviews, traveler tips, where to stay, and more tourist information, read our Cabras trip itinerary planner. Drive from Dorgali to Cabras in 2 hours. Alternatively, you can do a combination of bus and train; or take a bus. In September, plan for daily highs up to 34°C, and evening lows to 20°C. Wrap up your sightseeing on the 13th (Wed) to allow time to drive to Alghero. Do some cultural sightseeing at Nuraghe di Palmavera and Nuraghe Sant'Antine. You'll discover tucked-away gems like spiaggia di Lu Bagnu and Porto Ferro. 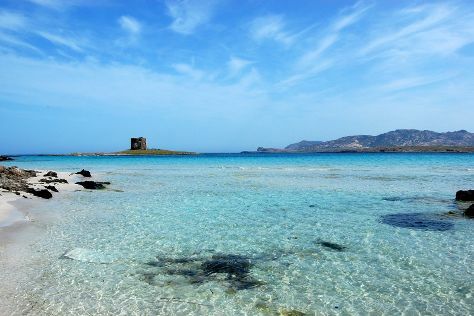 Explore the numerous day-trip ideas around Alghero: Stintino (IL KIOSCO BEACH STINTINO, La Pelosa Beach, & more), Santa Trinita di Saccargia (in Codrongianos) and spiaggia di Porto Ferro (in Sassari). Next up on the itinerary: get up close to creatures of the deep with a dolphin and whale watching tour, admire the masterpieces at Museo Diocesano d'Arte Sacra, delve into the distant past at La Necropoli di Anghelu Ruju, and learn about winemaking at Azienda Agricola Leda' d'Ittiri. To find traveler tips, reviews, photos, and more tourist information, read Alghero travel planner. You can drive from Cabras to Alghero in 2 hours. Alternatively, you can take a bus. In September in Alghero, expect temperatures between 32°C during the day and 18°C at night. Finish your sightseeing early on the 19th (Tue) so you can drive to Santa Teresa Gallura. 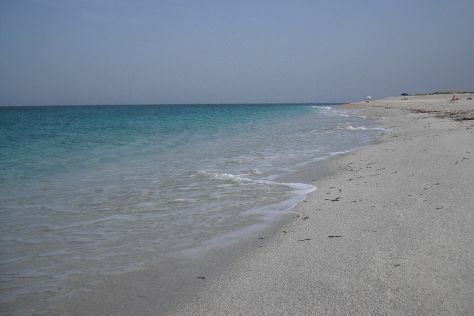 Kick off your visit on the 19th (Tue): make a trip to Cala Spinosa and then kick back and relax at Spiaggia Rena di Ponente. Get ready for a full day of sightseeing on the next day: kick back and relax at Naracu Nieddu Beach and then enjoy the sand and surf at Spiaggia Lu Litarroni. For where to stay, traveler tips, and other tourist information, use the Santa Teresa Gallura trip itinerary planner. You can drive from Alghero to Santa Teresa Gallura in 2.5 hours. Alternatively, you can do a combination of train and bus. 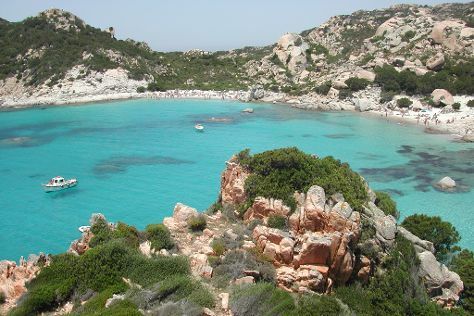 In September in Santa Teresa Gallura, expect temperatures between 32°C during the day and 17°C at night. Wrap up your sightseeing on the 21st (Thu) to allow time to travel to La Maddalena. La Maddalena is a town and comune located on the island with the same name, in northern Sardinia, part of the province of Olbia-Tempio, Italy.The townLa Maddalena is the largest town in the Maddalena archipelago, just 2km from the northeastern shore of Sardinia and sitting in the Straits of Bonifacio, between it and Corsica.The focal-point of pedestrian activity is found around Piazza Umberto I (formerly known as Piazza Comando-the older generation of natives in town still commonly refer to the piazza by its original name). On the 21st (Thu), explore the striking landscape of Parco Nazionale dell'Arcipelago di La Maddalena. For where to stay, traveler tips, more things to do, and other tourist information, use the La Maddalena itinerary maker. You can do a combination of taxi and ferry from Santa Teresa Gallura to La Maddalena in an hour. In September, daily temperatures in La Maddalena can reach 31°C, while at night they dip to 19°C. On the 22nd (Fri), wrap the sightseeing up by early afternoon so you can travel back home.